At the Mallorca pilot demand response (DR) events are run, comparing two identical air handling units (AHU) of two different wings of Son Llatzer Hospital building. 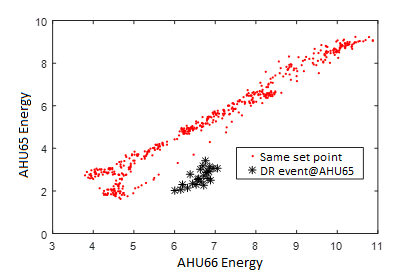 Analyzing the heating, ventilation, and air conditioning (HVAC) consumption during the DR events in two twin hospital patient’s rooms wings (one under DR event conditions and the other in normal conditions), the effectiveness of the DR events can be observed. In the tests run in December’17 and January’18 , we observed average savings of 40%.